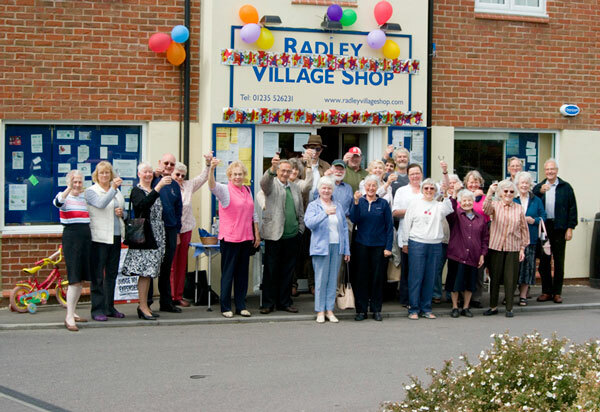 Customers visiting Radley Village Shop on Friday 22nd May were invited to partake in the celebrations marking the second anniversary of the shop’s opening. The shop was created by residents of the community and is staffed by a dedicated team of 70 volunteers who give of their time and expertise willingly and generously. John Goodenough, the shop manager, runs the retail activities on a day to day basis. Apart from the usual product lines of newspapers, bread, milk, tinned and frozen foods, the shop focuses on a carefully selected range of products with prices designed to be as near-competitive as possible with the big supermarkets. Niche market product are sourced locally and added to the range to add interest to the shelves. The shop prides itself on its fresh produce and sources eggs, fruit & veg from local suppliers. The shop takes orders each Thursday for quality meat supplied by a local butcher, ready for the weekend. Since its opening, local producers and suppliers are encouraged to supply high quality goods at reasonable prices, for example, Chutneys from Passionate Preserves, Cakes by Jude, both of which are made in Radley! Barbara Ellis, the retiring chairman, said: “Our shop has become an institution in the village and has become a focal point for all the villagers. It has been a pleasure to work with such a dedicated team of volunteers who have helped make the shop such a success”. Barbara is leaving for pastures new and is handing over the chairmanship of the community shop to Mike Sadler, who, with an executive committee of eight people, will manage the overall business.